Jillian Anne Ellis (born 6 September 1966) is an English-born American soccer coach. She coaches the United States women's national soccer team and is the development director of the United States Soccer Federation, overseeing the national youth teams development program. In 2015, the United States Women's National Football Team won the World Cup Championship under her leadership. Ellis was appointed head coach on 16 May 2014. Prior to this appointment, she served as interim head coach following the removal of Tom Sermanni on 6 April 2014, having previously held the position upon Pia Sundhage's early departure in October 2012. She has also served as head coach for various university and United States national youth teams over the years. Ellis did not play organized football until her family moved to the United States in 1981, as there was no organized football for girls in the UK in the 1970s. She captained the Robinson Secondary School team in Fairfax, Virginia to the 1984 state championship and won the under-19 national title with the Braddock Road Bluebelles the same summer. She went on to play as a forward at William & Mary from 1984 to 1987, when she was named third-team All-American. Ellis has a USSF "Pro" coaching license; with coaching experiences that includes multiple stints for the under-20 and under-21 national teams, and an impressive UCLA Bruins record as a coach. She is the Development Director of United States Soccer Federation. She served as assistant coach of the women's national team, head coach of a number of women youth teams, and was the interim coach of the senior women's national team in 2012, and for 2 matches in 2014. She was appointed the permanent head coach of United States women in May 2014. Ellis served as an assistant coach for three universities: at Maryland for three years, 1994–96; at Virginia for one year, 1996–97; and at NC State for another three years, 1988–90. As an assistant coach at N.C. State, Ellis helped the NC State secure the 1988 Atlantic Coast Conference title and a NCAA Final Four appearance. Ellis headed the Illinois women's soccer program for two years, 1997–1999. In 1998, she brought the Fighting Illini to a 12–8 record and a first-ever Big Ten Tournament berth. Ellis led UCLA to eight NCAA Final Fours, including seven in a row from 2003-2009, and won six straight Pacific-10 Conference titles from 2003-2008. She finished her time in Westwood with a record of 229 wins, 45 losses and 14 draws (229–45–14). She was the 2000 NSCAA National Coach of the Year after leading the Bruins to the NCAA Final in just her second season as head coach. Ellis has an all-time collegiate coaching record of 248 wins, 63 losses and 14 draws (248–63–14), compiled over 14 years at 2 colleges: Illinois Fighting Illini and UCLA Bruins. Ellis was the head coach of the United States under-21 women's national soccer teams, coaching a team to win the Nordic Cup title at Germany 2000 and to Sweden's 2005 Nordic Cup. In another stint as youth team's head coach, she guided the U.S. under-20 women’s national team to the CONCACAF title in 2010 and to the FIFA U-20 Women's World Cup in Germany. Ellis was appointed by U.S. Soccer as Development Director for the U.S. women's national teams in January 2011. The appointment, along with April Heinrichs as Technical Director, marked the first time U.S. Soccer had appointed full-time positions to oversee the programs and development of national women's youth teams. As Development Director, Ellis interacts directly with coaches within the youth club leagues and guides the U.S. under-17, under-15 and under-14 teams. Ellis was a scout for the U.S. women's national team at the Sydney 2000 Olympics, and while coach of the UCLA Bruins Ellis also served as an assistant coach under Pia Sundhage for the gold medal-winning U.S. women’s national team at the Beijing 2008 Olympics. Following Sundhage's departure on 1 September 2012, for Sweden, Ellis (as women's national team program development director) served as the interim head coach until U.S. Soccer hired Tom Sermanni as the full-time head coach on 1 January 2013. On 16 May 2014, U.S. Football announced that Ellis had been appointed as the national team's head coach on a permanent basis. Ellis's job as head coach was to qualify for the 2015 Women's World Cup and win the championship. On 5 July 2015, she coached the United States to a 5–2 victory over Japan to win the World Cup. [m 10] Ellis was honored as 2015 FIFA World Coach of the Year for Women's Football on 11 January 2016. In 2016, the U.S. women's national team recorded five shutout wins to secure the 2016 CONCACAF Women's Olympic Qualifying Championship. However, the team struggled during the 2016 Summer Olympics, drawing against Colombia in the group stage and eliminated to eventual silver medal winners Sweden — a team led by former national team coach Pia Sundhage — 4-3 on penalty kicks after drawing in regulation and extra time. The loss marked the first time that the U.S. women's national team did not advance to the gold medal game of the Olympics, as well as the first time that the team failed to advance to the semifinal round of a major tournament. The effort was further marred when U.S. goalkeeper Hope Solo called the Swedish team "cowards" for their defensive tactics. Ellis would later cite those comments as part of the reason why U.S. Soccer terminated Solo's contract and suspended her from the team. The U.S. women's national team won four subsequent international friendly matches (9-0 against Thailand, 3-1 against the Netherlands, and 4-0 and 5-1 in two matches against Switzerland). The latter two friendlies featured the largest roster turnover of Ellis's tenure as she brought in 11 uncapped players, started or played 6 of them, and left several regular players out of camp. Before the friendly against Thailand, Ellis warned U.S. women's national team midfielder Megan Rapinoe not to kneel during the pre-game performance of the United States national anthem. Rapinoe had done so before matches with her National Women's Soccer League team, Seattle Reign FC, prior to camp in support of other professional athletes' similar protests. Despite Ellis's warnings, she did not punish Rapinoe after the game. Ellis grew up in Cowplain, a small village near Portsmouth on the southern coast of England. Naturally athletic, she ran track and field, and played field hockey and netball, but did not play organized football as it was considered "unladylike" in 1970s United Kingdom. She would, however, tag along with her brother Paul and play with the boys whenever they needed an extra player. Her father John Ellis, a former Royal Marines commando, was a longtime soccer ambassador for the British government, assigned to help create soccer programs worldwide, including in Trinidad and Tobago and in Singapore. In 1981, the Ellis family moved to Northern Virginia, where he founded Soccer Academy in Manassas. Her brother Paul also became a soccer coach, coaching area high school teams and serving as an assistant coach at George Mason before taking a full-time position at Football Academy Inc.
Ellis earned a Bachelor of Arts degree in English Literature and Composition at the College of William and Mary in 1988, and was awarded an honorary Doctor of Humane Letters degree in 2016. She earned a master's degree in technical writing at North Carolina State University. Her mother Margaret "was horrified", on learning of her plan to give up her lucrative job as a technical writer at Northern Telecom to work as an assistant coach with subsistence pay, while John advised her to "do something substantial" instead. Ellis lives in Palmetto Bay, Florida a suburb of Miami with her wife Betsy Stephenson, whom she married in 2013, and their adopted daughter Lily. Ellis, along with her parents and brother, are naturalized American citizens. ^ "Meeting of the Board of Trustees of the University of Illinois" (PDF). trustees.uillinois.edu. 9 April 1997. p. 11. Retrieved 10 April 2016. ^ a b c "Jill Ellis Named Head Coach of U.S. Women's National Team". ^ a b "USWNT fires coach Sermanni, Ellis takes over in the interim". 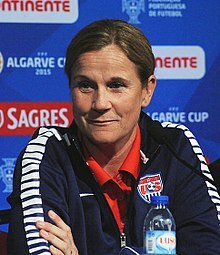 ^ a b c d "Jill Ellis interim coach of US women". Yahoo! SPORTS: The Associated Press. ^ a b c d e f g h i j k l m n o "Jillian Ellis". U.S.Soccer. Archived from the original on 24 November 2012. ^ a b c d e f g h Goff, Steven (11 June 2015). "Jill Ellis played soccer with boys. Now she leads U.S. in Women's World Cup". Washington Post. Retrieved 12 June 2015. ^ "Player Bio: Jillian Ellis". UCLA Official Athletic Site. Archived from the original on 13 September 2012. ^ "HEAD COACH: U.S. Women's U-21 National Team: Jillian Ellis". soccertimes.com. ^ "Jillian Ellis Named Coach of U.S. Under-20 Women's National Team". U.S.Soccer. Archived from the original on 19 August 2012. ^ "Soccer: Coach Jillian Ellis leaves UCLA". ESPN. ^ "B.J. Snow to coach UCLA women's soccer program, Jillian Ellis moving on". DAILY BRUIN. ^ a b "Heinrichs and Ellis hired to run girls program". SoccerAmericaDaily. ^ Wendy Soderburg (5 August 2008). "Bruin athletes vie for Olympic glory". UCLA Today. Retrieved 1 November 2016. ^ "Tom Sermanni Named Head Coach of U.S. Women's National Team". Archived from the original on 3 November 2012. ^ "Carli Lloyd and Jill Ellis Honored as FIFA Women's World Player and Coach of the Year". ussoccer.com. Retrieved 11 January 2016. ^ "U.S. bounced from women's soccer tournament by Sweden on penalty kicks". Los Angeles Times. 12 August 2016. ^ Grant Wahl (6 September 2016). "USWNT coach Jill Ellis speaks out on Hope Solo termination". Sports Illustrated. Retrieved 1 November 2016. ^ "Williams, Heath, Press, Mewis score for USA in big second half vs. Switzerland". 20 October 2016. Retrieved 1 November 2016. ^ Graham Hays. "New faces, new lineup lead U.S. women to 4-0 victory". ESPN. Retrieved 1 November 2016. ^ a b Graham Hays (19 September 2016). "Megan Rapinoe kneels again, defying 'expectation' of U.S. Soccer". ESPN. Retrieved 1 November 2016. ^ Molly Blue (18 September 2016). "Tobin Heath gets an assist, Allie Long scores in USWNT's 3-1 win against the Netherlands: Updates recap". The Oregonian. Retrieved 1 November 2016. ^ a b Hays, Graham (10 June 2015). "How Jill Ellis became the highest-profile women's coach in the world". espnW. Retrieved 12 June 2015. ^ Kauffman, Michelle (4 September 2014). "U.S. soccer coach Jill Ellis finds haven in Miami as she prepares for 2015 Women's World Cup". Miami Herald. ^ Wahl, Grant (27 June 2015). "USA finds inspiration in Supreme Court ruling for WWC win over China". Planet Fútbol. Sports Illustrated. ^ Kaufman, Michelle (29 June 2015). "Critics don't faze U.S. World Cup soccer team coach". Miami Herald. Retrieved 29 October 2015. ^ "Javier Hernandez and Carli Lloyd Named 2015 CONCACAF Players of the Year". concacaf.com. 22 January 2016. Retrieved 23 February 2016. ^ a b "U.S. Women's National Team and Germany Play to 1-1 Draw in Front of Sell Out Crowd at Toyota Park". U.S.Soccer. Archived from the original on 24 February 2014. ^ a b "WNT and Germany Play to 2-2 Draw at Rentschler Field". U.S.Soccer. Archived from the original on 26 February 2014. ^ "U.S. WNT Defeats Ireland 5-0 in Fan Tribute Tour, Presented by Panasonic". U.S.Soccer. Archived from the original on 2 December 2012. ^ "U.S. Women's National Team Defeats Ireland 2-0 at University of Phoenix Stadium in Glendale, Ariz". U.S.Soccer. Archived from the original on 28 February 2014. ^ "U.S. Women's National Team Defeats China PR 2-0 in Detroit". U.S.Soccer. Archived from the original on 10 December 2012. ^ "U.S. WNT Beats China PR 4-0 at BBVA Compass Stadium in Houston". U.S.Soccer. Archived from the original on 16 December 2012. ^ "U.S. WNT Beats China PR 4-1 to Wrap up 2012". U.S.Soccer. Archived from the original on 10 March 2014. ^ "Lloyd Hits for Two, Leroux Adds the Third: U.S. WNT vs. China". U.S.Soccer. 10 April 2014. Retrieved 11 April 2014. ^ "U.S. Rallies for 1–1 Draw Against Canada". U.S.Soccer. 8 May 2014. Retrieved 8 May 2014. ^ "FIFA Women's World Cup Canada 2015: USA 5 – 2 Japan". FIFA.com. 5 July 2015. Retrieved 29 November 2015. Wikimedia Commons has media related to Jill Ellis.